Is something that’s had all of its parts removed and replaced still the same object? It’s a question begged by Jack Thorne’s adaptation of Georg Buchner’s fragmentary – and unfinished – 1836 play. 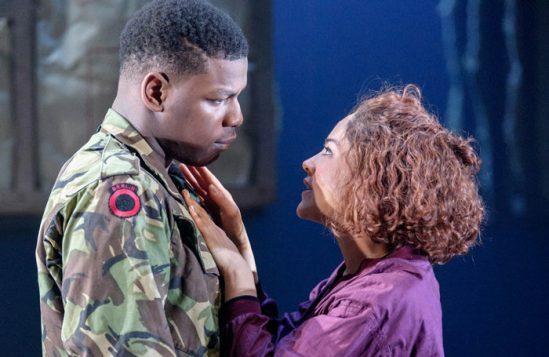 Gutted, given structure, relocated and updated, is Thorne’s play still Woyzeck? Well, yes and no. The essential structure is there and some scenes remain intact, but this is essentially a completely new play, and a ferocious one too, that grows exponentially in power as it progresses. It’s the play that Woyzeck would have been, needs to be, if written in 2017. 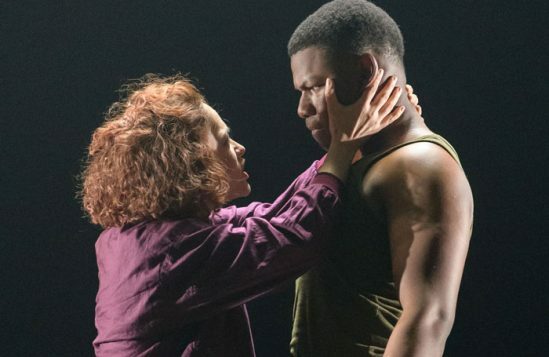 Gone is Woyzeck’s philosophising and the often ponderous language that infects English translations. 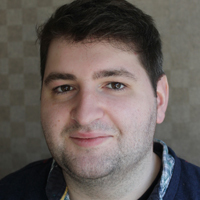 Instead, Thorne brings his pitch-perfect naturalistic dialogue to bear on a work that becomes about class, masculinity and mental health. We’re in 1980s Berlin, Woyzeck a soldier in the British sector guarding the Berlin Wall. His language is brutal and explicit, a snapshot of the coarse-as-grit banter between soldiers. 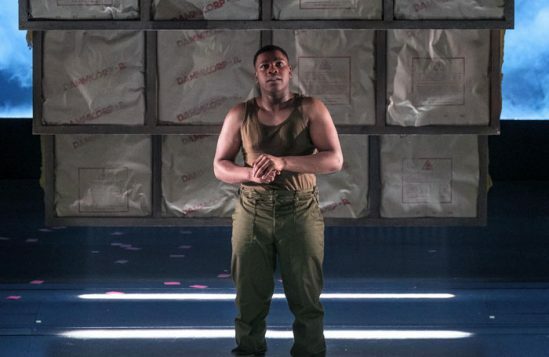 As Woyzeck’s childhood traumas haunt him, the world he lives in reveals its inequalities more variously and more insidiously than in Buchner’s original: Steffan Rhodri’s obliviously upper-class Captain Thompson doesn’t care about Woyzeck’s financial difficulties, while Ben Batt’s roguish, laddish Andrews – a breath of comic relief – calculatedly attempts to seduce Woyzeck’s girlfriend because he’s bored. Newly-minted Hollywood A-lister John Boyega, the star attraction as Woyzeck, starts slowly and with muted range. He tumbles through his lines on one note, and it isn’t clear if the ennui he emits is intentional or not. There are whispers of a latent ferocity and something mighty in his gestures, like a bull trying hard not to destroy the china shop. 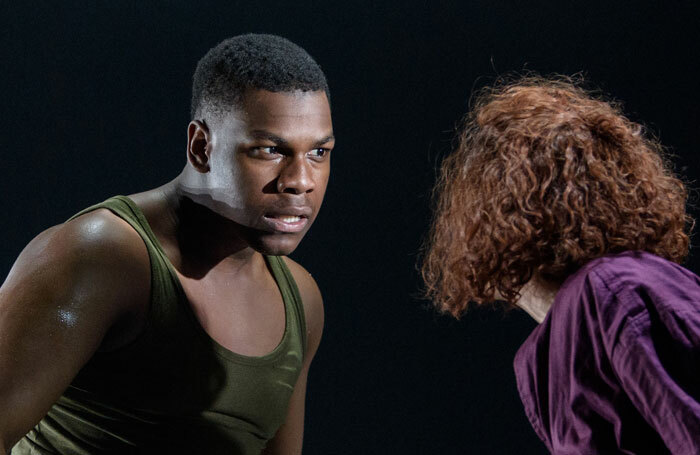 But, as the experimental drugs he’s taking to raise a bit of cash start to take hold and Woyzeck deteriorates, that ferocity explodes and Boyega comes into his own. He thrashes and thunders around the stage in a state of insanity, making Sarah Greene’s Marie look like a rag doll in his violent hands. It’s mightily impressive for someone whose last stage performance was in a minor role at the Tricycle eight years ago. 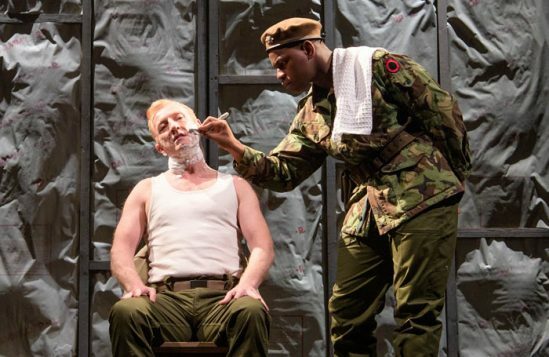 Around all of that is Tom Scutt’s monumental set, painted in shades of khaki and camo, great slabs like giant dominoes threatening to topple and engulf the actors. As well as looking like slices of the Berlin Wall, they’re also a constant physical marker of division and inequality. 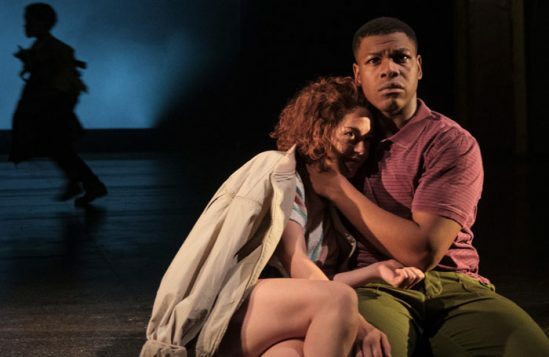 Joe Murphy’s increasingly trippy production goes for raw psychological drama over expressionism but, at its heart, it’s still potently about inequality and division in its many forms: psychological, biological, physical. 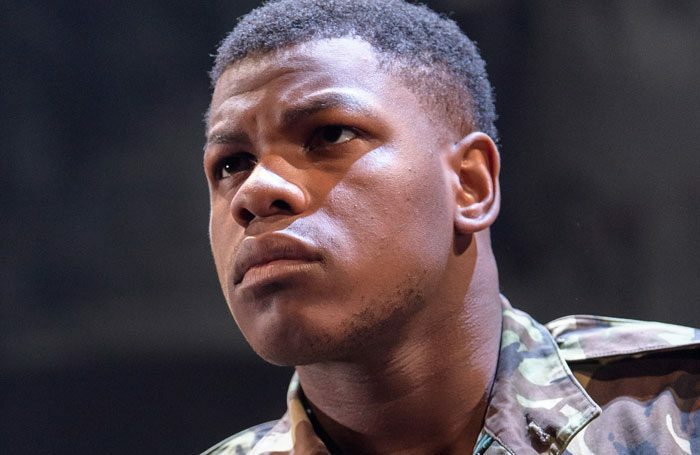 With Boyega attracting a younger audience, Murphy and Thorne have made a grizzling beast of a show. Though it’s almost 200 years old, this feels like a new play, savagely laying bare an unequal world.